How often do we actually think about the threads we stitch with? What do we know about them and the way they behave? 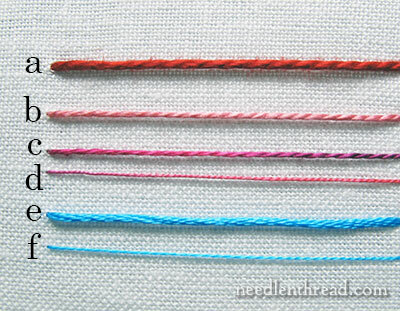 I like to occasionally explore these questions by looking at threads up close, because it’s helpful to know a bit about embroidery threads when making thread choices for embroidery projects. So the other day we discussed the differences between coton a broder and floche. Today, let’s line those two threads up with more familiar cotton embroidery threads: perle cottons and regular 6-stranded floss. Perle cottons are up first. You may or may not be familiar with perle cotton. It’s the stuff you find on the wall in the craft sections at hobby stores, in twisted skeins or wound into small balls of thread. You can also find it at needlework shops, especially those devoted to needlepoint, because perle cotton in the larger sizes is often used for needlepoint. Like the floche and coton a broder we discussed earlier this week, perle cotton is a non-divisible thread, which means you use one strand of it as it comes off the skein or ball. You don’t break it down into smaller sizes. 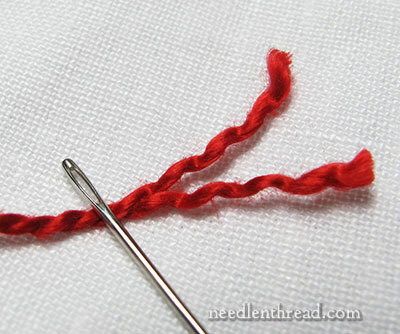 If you try to break it down and stitch with it, you’ll find that the thread strength is compromised, and the thread will shred easily and fall apart. Remember, the higher the number within any line of thread, the finer the thread. Sizes 3 and 5 are heavier, used often for needlepoint and sometimes for surface embroidery. Sizes 8 and 12 are relatively fine threads, often used for tatting and crocheted edgings and the like, as well as for embroidery. Crazy quilters love perle cottons, because they work extremely well for stitching decorative lines and bands. Perle cottons are also favorites with hand-dyers, which is why you can find many specialty colors and over-dyed perle cottons available through individual small thread-dying businesses. Now, let’s throw the ever-familiar 6-stranded cotton floss into the mix. In the photo above, “e” is a full six strands of floss, while “f” is one strand taken from the six. You can see that, of all of the above threads, one strand of regular stranded cotton floss (f) is the finest in size. Stranded cotton (called “floss” in the States) is a divisible thread, up to a point. After you pull the full thread from the skein, it can be separated into 6 finer strands, each of which can be used for very fine embroidery, or which can be put back together in any number of strands, for increasingly bolder lines. Once you get down to the single strand, though, it cannot be further divided for use, or it looses its strength and integrity. All of the threads above (including the stranded cotton) have the same construction. The photo above is perle cotton #3 up close. If you separate the twists, you find that perle cotton is constructed of two plies of thread twisted together in a relatively tight twist. If you separate the twists on one usable strand of cotton floss, you can see that it is also made up of two plies of thread twisted together. Cotton floss is not as tightly twisted as pearl cotton. It has a much softer twist, making it more suitable to certain types of embroidery, especially satin stitching and long and short stitch. There’s more “spread” with floss, because of the softer twist. And now, we’ll throw some floche into the mix. We already discussed floche in detail here. In the photo above, it’s the green thread at the bottom of the photo. Notice that it is heavier than the single strand of floss, and it seems to correspond size-wise to the #12 perle cotton, which is right above the thick bright blue floss. However, they’re not quite the same size, and their construction is different, so the threads will behave differently when you stitch with them. Finally, the burnt orange strand below the floche is coton a broder #25, discussed in detail here. So now you can see all these cotton threads lined up next to each other, to get an idea of their relative size. All the threads above are mercerized (they have a sheen, brought about artificially by a chemical process). 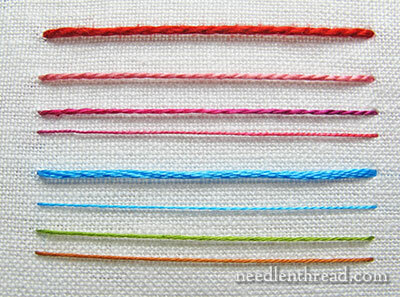 They are all s-twisted threads (you can read about the difference between s- and z-twisted embroidery threads here). They are all made up of a certain number of plies, twisted together to make the usable strand of thread. One thread featured above is divisible – the regular stranded cotton floss that breaks down into six usable individual threads. They differ in number of plies twisted together to make the individual strand: perle cottons and floss are made of two plies; floche is made of five plies; coton a broder is made of four plies. They differ in the tightness of the twist used to combine the plies. The stranded cotton and the floche have the loosest twists, coton a broder falls in the middle, and perle cottons have a tighter twist. How Does this Affect your Embroidery? 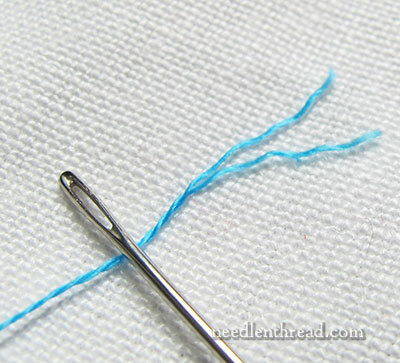 What it boils down to is this: the weight of the thread (the thickness) and the degree of the twist (and the number of plies) make a difference in the way stitches look. These characteristics affect the size of stitches, the way the stitches work together and fit together, and the way the stitches reflect light. And all of these points influence the outcome of your embroidery. We’ll examine this point visually with some stitched samples later this week! I am continually amazed at the detail and care you take to explain & to photograph all that goes into your decisions on each piece. Thank you for such a thorough education. Thank you for the very clear explanation and photos. Thanks so much! That satisfies so much curiosity and answers so many questions! This information will be extremely helpful in the future. Thank you Mary. For years I have been looking for a good explanation of threads. I was so clear to me. This is fantastic. Likely kind of dull for you, but for those of us who have never seen floche and coton a border before, it is fantastic. I can’t wait to see more. Then maybe I’ll actually try stitching with a new thread type! Very, very informative and interesting. And so clearly explained. Thank you. I have never felt as well educated about thread. Thanks for all the comparisons. 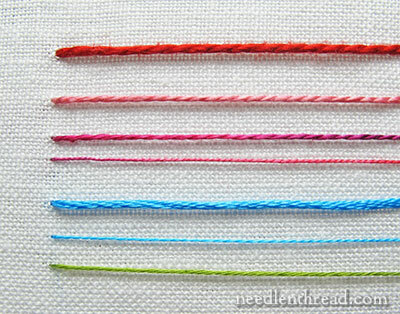 I love thread talk and you have explained in great detail the differences and the effect these threads have on embroidery projects.I love the examples of the thickness and twists of the threads above. I didn’t know that chemicals was added to these strands to make a sheen that is very interesting. I can’t wait for the visual stitch examples that will really help me in choosing threads for my future projects. Please could you do the same for silk threads which I tend to use more then the mercerised cotton threads. Thanks Mary for the examples and the photos which are great examples on the variations of thread very helpful. Thank you so much for this tutorial on threads. I started embroidering as a young girl, taught by my mother, who was busy raising a brood of 8 children. I had never used anything but the embroidery thread that was in the case at the local 5 and dime. Now, as an older adult I have the time to expand my knowledge, but didn’t know where to start. I’m planning to follow along on the hummingbird project and am enjoying every one of your posts. Thank you! This is all very interesting. When my husband came up behind me just now, giving me a hard time for being on the computer, I told him that this was me going to school. Thank you for all your info. I will be very interested as you continue to analyze thread in preparation for the hummingbird. Very nice, Mary. And with pictures — so it easier to understand. Thanks very much for the tutorial. I have been following your emails for a few years but have not tried anything until now. I am going to work on the Secret Garden project, have my fabric and pattern. This is so exciting. I haven’t done serious embroidery work since I was a young mother. Your explanations for this project are so clear and encouraging. I actually think that I can do this. At 75 it is great to be able to take on a new challenge to learn and be inspired. Thank you so much. Thank you , thank you for the great information on threads….. I really understand more about the different types now….. I loved the information……. Thank you for all you do for us out here….. There is hardly a day that goes by the you have not enlightened me about something new. You are wonderful for teaching is at home…. Hi, Mary. I’m enjoying all this information about threads. Since I added bobbin lacemaking to my list of hobbies (obsessions? ), I’ve often used the book Threads for Lace by Brenda Paternoster who lives in the U.K. Her book lists 1425 threads from around the world by brand name and size, if available. There are separate chapters for linen, cotton, silk and hair threads, synthetic and manmade threads, and glitter threads. She includes whether threads are S or Z twist and the number of wraps per centimeter which Brenda determines herself. The number of wraps/cm helps lacemakers find a substitute thread of the same thickness when a pattern calls for a thread that we don’t have or is unavailable. The more wraps/cm, the thinner the thread is. There is another chapter that lists all threads by the number of wraps/cm which is a great help. This study of threads is wonderful! I have learned so much! Thank you! Mary, I seldom print out articles, but your discussions on threads are going onto paper and into my work bag. Will you be going into silks, wools, linens, soys, or the more unusual fibers? This info is the part of the foundation work of a great outcome in the finish of a project. With your info, I am slowly building up knowledge of needles, threads and fabrics while completing some fun projects that turn into gifts. (except the Nesting Place — that is mine!) Your work is a blessing Mary. Thanks a bunch. I,too, am continually amazed at how well and thorough you cover your explanations.I have learned and continue to learn so very much from you. As an educator you are, by far, the best I have ever encountered. Your explanation of the threads and their characteristics gives us more knowledge in how and when to choose a certain thread which is extremely helpful to me. I now understand them and will be more able to choose the one best for the job at hand. Thanks again for being such a great teacher!! I hope you know how much you are appreciated. This is g-r-e-a-t!! Can’t wait!! I get your emails everyday and even though I have done very little embroidery… I am fascinated by all the information. Some time ago I taught some children how to do cross-stitch and back-stitch. I wanted to use indivisible thread rather than floss(I thought it would be simpler) but because I didn’t know about the options you mention in today’s post,I bought a whole array of the ‘craft’ thread from Michael’s. Is ‘craft’ thread explained somewhere on your site? Is it one of the above? Or is it just simply a ‘no-no’? which Ruth Lyon suggested regarding threads. I looked at the addendums to Brenda’s book and have been bowled over by the plethora of threads available around the world. Thank you Ruth. I have often wondered if using size 12 perle coton could be use instead of two strands of floss when doing red work. It seems to me that it would twist less in the needle with one strand of perle than two strands of floss. Any comments? I’m enjoying the information but sadly, not likely to remember it all. I can barely remember what I had for breakfast yesterday. Is there any way to have a single page with a photo of the 8 threads above with name and number to compare size. And then a line or two about each one that describes plies, strands, divisible or not and what they’re good for? Sure thing – in your spare time just whip it up for us. LOL But it would be an excellent reference for us. WOW! All my questions answered! Thank you for taking the time to show examples and photograph them. Your explanations are understandable, which makes you a good teacher. Wow, Mary, I have enjoyed your posts immensely all along, but my goodness you are truly outdoing yourself. This is extraordinary information. Understanding your “tools” and mediums is so important to the finished product. Thank you, thank you. I feel like I am taking a class so that I can later produce something wonderful. Thank you so much for explaining all these thread differences. It just hadn’t occurred to me before how important it is to know, – just as an artist needs to know how different paints behave. Loving this site! Thank you very much! I have a random selection of threads either inherited or bought at garage sales, and this has identified most of them for me. At a guess the exceptions – ‘Lion Triumphant Best English made rope embroidery’ and the almost-identical ‘Perilusta stout embroidery for art needlework’ – are size 3 perle. I’ve learned so much from reading your blog. Its an indispensable resource. I look forward to buying from your shop as a way to keep this blog going! I’m just a lowly beginner but I am so inspired by you. Its like I’m getting a college education via the internet. The articles are somewhat old – I’ll be doing some updates soon on the subject. In fact, it’s on my list of articles in the next several weeks. Eterna silk no longer exists (the business went belly up). Pipers regular silk “floss” is a very fine, flat silk. It’d be hard to compare it to a thread like DMC floss, but, strand-wise, one strand is finer than DMC. You can always use more than one strand at a time. Thank you for such a quick response. I’ve mostly used 6 stranded Anchor and DMC cottons as well as perle cottons, so silk is a new entity to me. I will read your articles and make some choices from there. And if you look on the small band of your DMC embroidery floss you’ll see that it is 25 metres per gram . Thank you so much for the sample of thread sizes. It was very helpful to me! I am interested to start a schwalm project. The recommended thread is dmc broder special. But I cant seem find it anywhere locally or Europe. Can I change this to DMC perle cotton? Hi, Charmaine – you might try looking for what’s called “soft cotton.” There are different websites in Europe that sell whitework theeads, like Marie Suarez in France. Another resource – you might try looking up Luzinne Happel in Germany. She could tell you where to find whitework and Schwalm supplies. I love to do punchneedle pictures. I frequently use anywhere from 1-3 strands of DMC floss depending on the fineness of the detail I’m looking for. I’d love to try different threads to vary the look I achieve but I’m not familiar with any threads outside common DMC skeins. I like natural threads like cotton or wool as long as they are colorfast. Does anyone have any experience using more fine weights of thread (like 1-3 strands) besides DMC floss while punching? Thank you! You have the best rxplaination I have seen so far. I have just started punch needle. I am trying to find out what size perle cotton would be about the thickness of three strands of DMC floss. What woyld you suggest? Thanks again! I keep making broad internet searches on needle related topics, and then smiling that sure enough, the useful article was yours. Again. So, thank you for all the work you’ve done for the rest of us! Thank you for this explanation of various threads. I’m just starting punchneedle embroidery and am only familiar with regular floss. After this, I plan to try various other threads to see how they affect the finished project. I’m trying to figure out what kind of thread to get for my mom who has done candle wick quilting for years. The thread that she was using is no longer carried in the catalog…and I can’t quite figure out if what she probably needs to substitute would be a #3 perle?? thanks for the help. 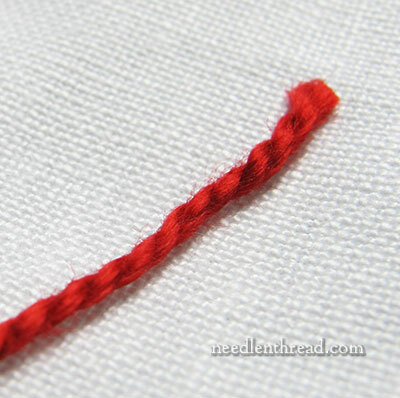 Hi, Lynn – Lacis.com carries candlewicking thread. If you go to their online catalog and search “candlewicking” the matte cotton threads normally used for it will come up. There are two item numbers JS02 and JS03. 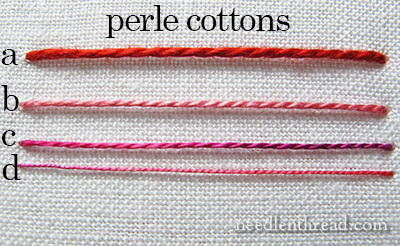 Perle cotton is not a matte cotton thread, and it is quite tightly twisted. I think the size #3 would be far too heavy, and it would give a completely different look to the stitching. I’d try the stuff at Lacis.com before substituting to a totally different thread, since switching out can sometimes make the stitching experience significantly less pleasurable! Also, if you search online for “Mountmellick Thread” and you find a place that carries it, it normally comes in at least three weights (thicknesses) and is the same stuff, essentially. I am sewing a collarless lined, long stretch velvet jacket. I am at the point where the pattern says to machine topstitch all around the neckline and down both sides of the front. Rather than do that by machine, I would like to make running stitches with perle cotton, by hand. I want the stitching to be not only functional, but decorative also. I was thinking of using size 8 perle cotton. What size hand needle should I use? The jacket is a plain copper and will have a black lining. Do you think that I should match or contrast the the stitching? It will be worn mostly with pants, leggings and jeans. Hi, Barbara – I’d probably use a size 24 chenille – maybe a 22. Or you could try a size 5 crewel needle. You’d have to test it. I don’t know how the fabric and the needle will play together. There’s the whole stretch thing going on, which can cause puckering problems as you stitch. I think you should test different needles, maybe on scrap fabric, and see how the stitching goes. If you’re top stitching at this point, I’m guessing the lining is already sewn together with the velvet? Will you be hand stitching through both the lining and the fabric? As for color and contrast, that’s really a personal thing. If you want the stitching to show up (which is, I suppose, the whole point of decorative stitching), then a contrast might be better than a match! I have several balls of my grandmothers Perle cotton from her days of Swedish stitch Samplers. I don’t have any labels to show what size, either 3 or 5. She used Huck toweling to do the craft, and her work is museum quality. I want to do some towels, I know how to do the stitch, just need practice. Can you help me? Such helpful info. Thanks so much. I am stitching the sampler Stitch Therapy 365. Bc I have so much DMC emb floss, I decided to use that instead of the Aurifil floss which is recommended. Would you think 2 strands of the DMC would equal the Aurfil floss? thanks! I am looking for something that would be very comparable to Anchor’s pearl cotton size 12 in the 926 color (light beige/ecru) Any suggestions? You might check DMC perle cotton 12 in color number 712. I don’t know if it will be exact, because I don’t have them to compare, but on color conversion charts between DMC and Anchor, 712 is the corresponding color for Anchor 926. Hope that helps!